Holmatro, established in the Netherlands in 1967, originally traded high-pressure hydraulic equipment for the shipbuilding industry. Today, we design, develop, manufacture and supply high-pressure hydraulic industrial equipment and rescue equipment for specialised industries worldwide. Holmatro industrial products are innovative, high-quality and effective under diverse conditions. With offices in the Netherlands, the US, China and Poland, including an extensive dealer network, we are dedicated to producing high-performance solutions for specific markets and applications. Our ambition is to find result-oriented solutions that combine working with extreme forces with controllability, convenience and safety. Your wishes and experiences are at the core of this process. Holmatro is a Dutch company that is ready to help you anywhere in the world. With state-of-the-art production facilities in the Netherlands and the US, a dedicated team and an extensive dealer network we offer innovative, high-quality products that you can trust. We have expertise when it comes to converting ideas into products. It is an on-going process in which different departments work closely together on cutting-edge developments. Moreover, the most stringent quality standards are enforced. This is why we can state with sincerity that our products are unique and of an extremely high quality. See for yourself. Holmatro has developed, produced, tested and delivered mechanical as well as high-pressure hydraulic equipment for the shipbuilding industry for almost half a century. From this experience we have gained an understanding of the industry’s high demands regarding equipment quality, strength and durability. From the early construction stages to the actual ship launching we offer reliable solutions to control and shift heavy loads in a safe and easy manner. These solutions include wedges for ship stabilisation, pulling cylinders to pull together ship sections, cylinder sets for propeller mounting and custom-made ship launching sets. In addition to specific shipbuilding equipment, Holmatro offers a wide range of hydraulic lifting, pushing, pulling, bending and cutting solutions for various industrial applications. This profile shows just a few of the possible uses of our high-pressure hydraulic, pneumatic and mechanical tools. Feel free to contact us or please visit our website for more information on our industrial tools, systems and specials. For levelling offshore wind turbine foundations in order to realise the optimal effect, Holmatro's lightweight hydraulic cylinders are the right choice. In this example case we are taking a closer look at the installation of an offshore wind farm where the turbine foundations come in two parts. Holmatro's mechanical jacks are resistant to heavy-duty working conditions, which make them ideal for the ship building industry. Using the latest technologies as a starting point, our engineers have once again succeeded in putting the multi-purpose cylinder concept into practice. Holmatro propeller cylinders are highly suitable for pressing ship propellers on and off. Launching a ship sideways into the water safely in an extremely controlled manner is possible with the aid of Holmatro's custom-made Ship Launching Sets. 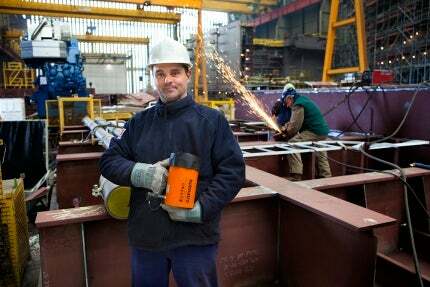 Holmatro's ship wedges are positioned underneath a ship section during the stages of construction and repair. They also facilitate launching the vessel after the works have been completed. A Holmatro customer mobilised a team to draw up and execute a salvage plan for a stranded ship. The operation consisted of the installation of additional strong points on the afterdeck to the installation of skid beams in combination with Holmatro lifting bags in the bulbous bow. For the installation of offshore wind farms, the components, including monopiles (MPs) are transported by sea on specially constructed heavy-lift vessels. Our customer designed the so-called seafastening construction for an installation company ensuring that the MPs remain securely in position, even in the most extreme circumstances. Each ship launch is an impressive event. Especially when you realise that an object of 8,000t of steel or more, is released by just pressing one button. In order to do this safely and controlled an intensive preparation as well as the right equipment are of vital importance. Wondering how to lift a uniquely-shaped ship from and place it back into a dry dock without damaging it? That is the question a Holmatro customer was faced with regarding its ferryboats. Netherlands-based Holmatro, which designs, develops, manufactures and supplies high-pressure hydraulic industrial equipment and rescue equipment for specialised industries worldwide, provides simple safety guides for its products. Roller boxes are designed to carry the welded pipeline of a stinger and support it into the water. For this reason they have to be adjustable in different height positions, according to the calculated allowable bending curve. The platform supply vessel PSV 5000 CD is a new class of ships offered by Damen Shipyards Group for transporting cargo and supplies to and from oil and gas rigs.